Pooling resources can raise the income of a multi-generational household above the level for other households. There is a trade-off, however. Multi-generational living arrangements also mean there are more people in the household to support. In 2009, the average number of residents in multi-generational households was 4.3, compared with 2.4 in other households. Thus, sharing resources benefits all only if the economies realized from living together exceed the costs of adding people to the household. Because of the trade-off, it is possible that not every member of a multi-generational household is better off as a result of the living arrangement, but the arrangement can provide a safety net for some. For example, parents who take in an unemployed adult child may be financially strained as a result but their action may have pulled the child out of poverty. The analysis in this section uses two yardsticks to measure the potential economic benefits of multi-generational living arrangements: household income and poverty status. Because multi-generational households differ from other households in size, incomes of all households are standardized to reflect a household size of three (see Appendix B for the methodology). The evidence suggests that the formation of multi-generational households may result in economic benefits for residents of those households—boosting household income, in spite of the increase in household size, and placing a safety net under those teetering on the economic ledge. For the overall population, living in multi-generational households does not necessarily yield higher incomes because the increase in household size effectively counters the rise in household income. But there are important exceptions: Hispanics, blacks, immigrants and unemployed workers experience significant gains from multi-generational living arrangements. 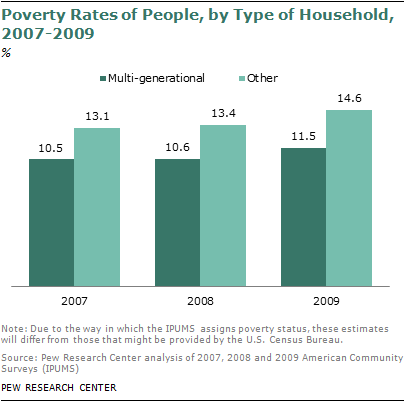 The formation of multi-generational households does appear to lift people out of poverty. That is true for the overall population and for subpopulations that are generally less well off than average, including unemployed workers, young adults, Hispanics, blacks and immigrants. Poverty levels for many of these groups are substantially less within multi-generational households. 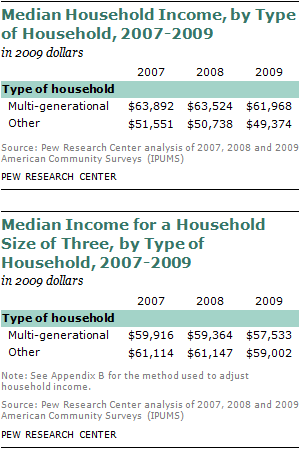 The economic benefits associated with multi-generational households have been relatively constant from 2007 to 2009. But many more people appear to have sought those benefits during the recession. Thus, the rise of multi-generational households in the recession could be viewed as the American public’s self-designed anti-poverty program. The median income reported by multi-generational households is higher than the income reported by other households. In 2009, the reported median income of multi-generational households was $61,968 compared with $49,374 for other households, a gap of 26%. A similar gap existed in 2007 and 2008. It is necessary, however, to account for size differences: Multi-generational households average 4.3 residents, compared with only 2.4 for other households. Using the methodology described in the appendix, all household incomes are standardized to a household size of three. After differences in household size are accounted for, the income of multi-generational households is below that of other households. In 2009, the median of the adjusted income for multi-generational households was $57,533, or 2% less than the median $59,002 adjusted income for other households. The same modest difference, to the disadvantage of multi-generational households, existed in 2007 and 2008. This benefit has prevailed consistently since 2007. The poverty-reducing role of multi-generational households is notable in view of the fact that those who typically have lesser financial resources than average—unemployed workers, young adults, Hispanics, blacks and immigrants—are also more likely to reside in these households. No single group appears to benefit more from living in multi-generational households than unemployed workers. A spell of unemployment, of course, reduces household income. However, multi-generational households with one or more unemployed residents sustain a much higher income level than other households with unemployed residents. Most strikingly, the poverty rate among unemployed workers in multi-generational households is notably lower than the rate among unemployed residents of other households. Households that did not have unemployed residents had size-adjusted median incomes of about $60,000 in 2009. For these households, median incomes were similar regardless of whether they were multi-generational. Households that include someone who is unemployed have much lower incomes than households that do not. But for these households, multi-generational status matters quite a bit. In 2009, the typical multi-generational household with an unemployed resident had a size-adjusted income of $48,542. That was nearly 20% greater than the median income of other households with unemployed residents—$41,115. Consistent with the finding on income, people experience higher poverty rates if they reside in households with at least one unemployed resident. But how much higher again depends on living arrangements. In households without any unemployed residents, the poverty rate ranges from about 10% in multi-generational households to about 13% in other households in 2009. Among households with unemployed residents, there is a striking advantage to multi-generational living arrangements. Some 16.3% of people who lived with unemployed workers in multi-generational households were in poverty in 2009. In sharp contrast, the poverty rate among people living in other households with unemployed workers was 27.5%. Looked at from another perspective—the poverty profile of unemployed workers themselves—the benefits of multi-generational living emerge in sharper relief. In 2009, the poverty rate among unemployed workers living in multi-generational households was 17.5%. That was only slightly more than half the 30.3% rate among unemployed workers who lived in other households. The potential benefits of living in multi-generational households—higher income and lower poverty rates—vary across groups. By household type, the largest differentials in income and poverty are among Hispanics, blacks and immigrants. For Asians, the gains are small. Whites and the native born appear to experience minimal gains from multi-generational living arrangements. Economic outcomes, especially poverty rates, for young adults and the elderly also appear better in multi-generational households. Elderly persons may also benefit economically from multi-generational living arrangements. For those ages 75 to 84 in multi-generational households, the poverty rate was 6.6% in 2009, compared with 10.8% for those in other households. Similarly large differences exist for those ages 85 and older. Who pays the bills? In most households with parents and minor children, it is mom, dad or both. But in multi-generational households it could also be the adult child, the elderly parent or the grandparent. This section considers the issue of financial responsibility from two perspectives: the share accounted for by a generation, for example, mom and dad together; and the share accounted for by an individual, such as mom or dad alone. The generation in charge of a household—the head alone or in combination with a spouse, sibling, sibling-in-law, partner or another individual of the same generation—typically accounts for the largest share of household income. But the distribution differs sharply by household type: There are more sources of household income in multi-generational households. In multi-generational households, the head and others of that generation account for a median 69.6% of household income. In half of the multi-generational households, the householder generation accounts for more; in the other half, the householder generation accounts for less. When children ages 25 and older and others of that generation live in a multi-generational household, they typically account for 25.2% of household income.19 The parents of a household head also provide a significant share of household income—the median share among the multi-generational households in which they live is 20.5%. In more than half of households without multiple generations, householders and others of that generation are the only sources of income. 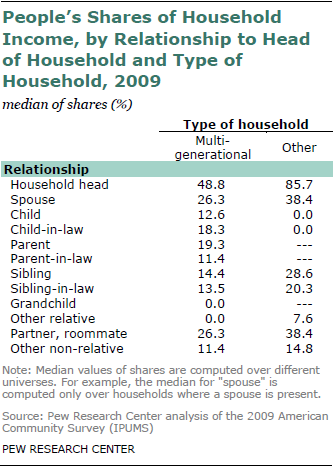 Thus, the median share of this generation in households that are not multi-generational is 100%. These share levels have been steady over duration of the recession. A similar pattern emerges when household income is sourced across individual members of the household. A household head alone accounts for slightly less than half (48.8%) of income in a multi-generational household. Myriad individuals also add to total income in these households. A child of the head of a multi-generational household typically accounts for 12.6% of income, a child-in-law 18.3% and a householder’s parent 19.3%.20 Significant shares also come from parents-in-law, siblings, partners and others. Heads of other households account for 85.7% of household income. Because these households have fewer family members (and, therefore, fewer potential earners), typical shares of spouses (38.4%), siblings (28.6%) and siblings-in-law (20.3%) are also greater than in multi-generational households. 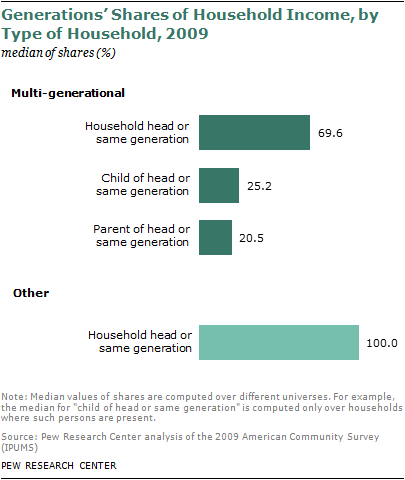 The majority of multi-generational households (56%) consist of two adult generations: either a head with a child 25 or older or a head with a parent in the home.21 Both adult children and parents of householders account for sizable shares of the incomes of these households. In 2009, the median share of household income from a child 25 or older in a two-generation multi-generational household was 24.7%. Parents living in their adult child’s household accounted for virtually the same amount—24.8%. 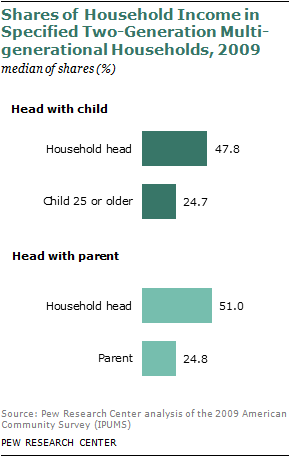 The heads of these households accounted for 47.8% of income in households that included their adult children and 51.0% of income in households that included their parents. Household heads account for less of household income when they are unemployed, as might be expected. However, their share of household income is reduced more if they are part of a multi-generational household. In multi-generational households, it may be that the living arrangement eases the burden on an unemployed householder to provide for the household. In other households, however, there is less “make-up” income. In 2009, employed heads of multi-generational households typically accounted for 54.1% of household income. But if they were unemployed, their share dropped by a third, to 35.3%. In other households, the heads were responsible for about the same share of household income regardless of employment status—83.2% if employed and 80.8% if unemployed. The shares in household income of adult children, 25 or older, who live in multi-generational households varies greatly by their employment status. Employed children 25 or older accounted for almost a third (31.4%) of household income in 2009; unemployed children of this age accounted for only 9.1%. Reflecting differences in the average number of earners across households, there are more sources of income in Hispanic and Asian households than in white and black households. The same is true in immigrant households, the vast majority of which are headed by Hispanics and Asians, compared with headed by the native born. On average, a multi-generational home with an Hispanic or Asian householder has 2.6 earners in residence. That is higher than the average number in white (2.1) and black (2.0) multi-generational households. Consequently, in multi-generational households, the typical Hispanic head of the household accounted for 42.3% of total income and the typical Asian householder accounted for 43.9%. These shares were less than those of white (50.0%) and black (52.0%) heads of multi-generational households. 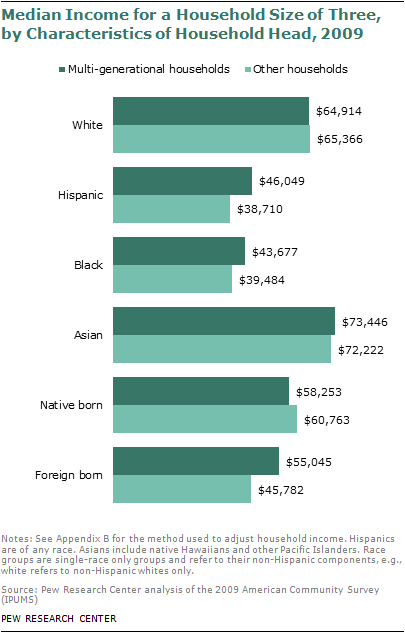 The differences by race and ethnicity are also present in other households—Hispanic and Asian heads account for less household income than whites and blacks. Most notably, blacks who are the heads of other households typically account for all of household income. This pattern is also due to differences in the average number of earners in other households by race and ethnicity—1.6 in other households with Hispanic heads, 1.5 in Asian households, 1.3 in white households and 1.2 in black households. Foreign-born heads of multi-generational households account for 42.7% of total income, compared with 50.1% for native-born heads of such households. In other households, immigrant householders account for 79.2% and native-born householders 86.6%.